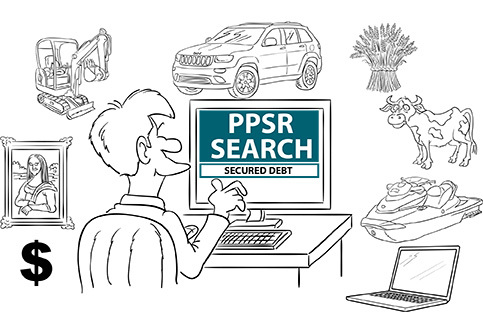 HAVE YOU SEARCHED THE PPSR? Despite being introduced over six years ago, the Personal Property Securities Register or the PPSR is still widely unknown in business. The PPSR is the single national register of security interests in personal property. Personal property includes vehicles, stock and equipment or basically anything that is not land, buildings or fixtures. A security interest is an interest in personal property that secures payment of a debt or other obligation but can also be considered as a way of establishing ownership. The PPSR combined approximately 20 State based registers and 5 million registrations into one national register. For most people, the most common security interest was the fixed and floating charge registered with ASIC. These fixed and floating charges are now recoded as a security interest on the PPSR. When buying goods – you can search the register to see whether the goods you are buying are used as security for a debt or other obligation. For a small search fee, you can search the register to make sure the goods that you are buying are free of debt and safe from repossession. When selling goods (retention of title) – if you are selling goods and have not been paid for them, then a registration on the PPSR shows searches that you are claiming an interest in the goods. The protects you in case the purchaser defaults or goes into liquidation before paying you. When leasing or hiring out goods – if goods are not in your possession, then you should register on the PPSR to protect your interest as owner of those goods. If not, and your customer goes broke before paying you or returning the goods, then your goods may be sold to pay other creditors. As can be seen above, the PPSR provides a number of key protections to business. Despite this, many businesses are still unaware of the PPSR or do not understand the ramifications of failing to register a security interest. For a $3.40 search fee, you can search the register. This could be over your own business to see who has registered against your ACN or ABN, you might be surprised to see who has registered a security interest against you! You may want to search a customer (or potential customer) to see what registrations they have or you may want to search over the vendor of a business or asset which you are buying to ensure that no third parties can claim an interest in what you are purchasing. It is important that your business contract, terms and conditions or credit application have the correct provisions to enable you to register a security interest on the PPSR. Further, there is no point having the requisite clauses in your contract without actually registering the security in a timely and accurate manner. One registration for 7 years costs less than $10 and as noted above, can prove a significant risk protection tool. If you have any queries regarding security interests or the PPSR, please contact Jarrod Ryan (jarrod@ryandurey.com) or Alyce Cassettai (alyce@ryandurey.com).